Joint injuries and other orthopedic issues are addressed with the help of implants, on a major scale. A similar procedure is carried out in the case of animals too. There are a number of implant types in the market, such as Total Knee Replacement, Tibial Tuberosity Advancement (TTA), Tibial Plateau Leveling Osteotomy (TPLO) Implants, Advanced Locking Plate System (ALPS), Total Elbow Replacement (TER) and among others. Among these products, TPLO is projected to hold the leading market share as compared to the other types. It is expected to lead with a significant margin and reach a value of over US$ 980 Mn by the end of 2026. However, in terms of growth rate, TER will propel at a CAGR of 10.3% during the forecast period. The sub-segment of trauma fixations is also expected to project progressive opportunities in the future. The bone screws hold an extensively high market share and is expected to project exceptionally high growth rate in the years coming ahead. Adoption of pets has also increased the growth prospects of veterinary hospitals. The sector is considered to be lucrative with growing demand for extensive pet healthcare. The number of veterinary hospitals is growing across all the geographical regions. According to the American Veterinary Medical Association the veterinary expenditure per household per year (mean) for dogs is US$ 378 and for cats is US$ 191. The average spending on the pets has also increased in the wake of increasing concerns for pets. People are ready to spend more, which will impact the growth of veterinary hospitals market. Furthermore, sports-related injuries in pets are expected to drive the orthopedic veterinary implants market. Several sports and adventure events for pets are conducted in the U.S. This has led to an increase in accidents and related injuries. A similar case is also observed in dogs owned by army forces, as they are more exposed to the risky environment and are prone to face more injuries. There are only private insurance facilities available for the people in the U.S., which is also based on the type of premium chosen, which cover diagnostic and laboratory tests. Lack of proper insurance policies available for major surgeries, may result in reluctance of people spending much on implant procedures. These procedures come under the category of extensive surgeries and thus, cost higher than any other surgical procedure. It includes the cost of implants and other surgical tools. Other than this, many people are also not aware about the veterinary implant procedures. These cases are more prevalent in the developing regions, where advanced techniques reach people in a little longer time as compared to the developed regions. 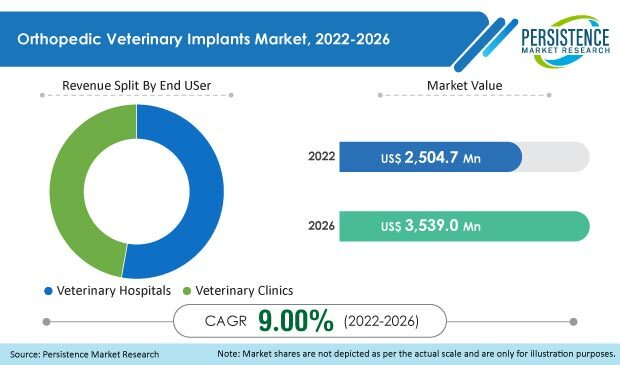 In some geographical regions veterinary surgeons are also not available to operate the surgery, which is a major challenge for the growth of the market and will be also responsible for lowering its demand in near future.